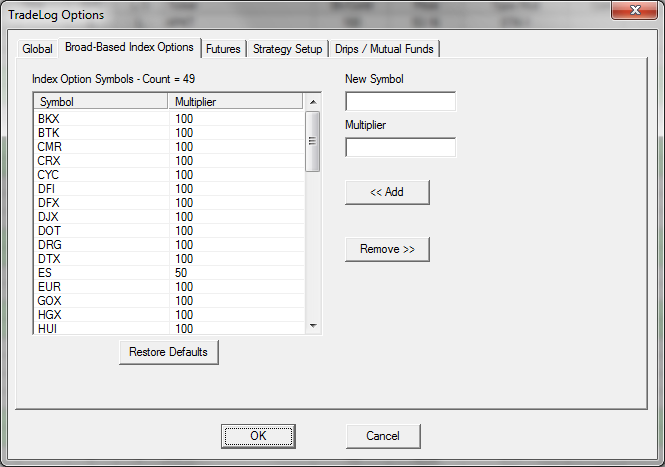 To define these settings go to Options menu, select Global Options, then select the Broad-Based Index Options tab. A list of currently defined symbols will be listed. To add a symbol: enter the ticker symbol in the New Symbol field, then enter the Multiplier; click on the Add button to add the new symbol. To restore the default list of broad-based index options, click the Restore Defaults button.